BRISTOL – While the dog days of summer are technically over, hundreds of dogs and their owners helped kick off Labor Day weekend at Rockwell Park on Saturday for the fourth annual Bow Wow in the Park. Clear skies and dozens of vendors helped make this year’s event a success, and organizers are happy they were able to raise so much money to support four-legged friends. While hanging out with dogs all day is a clear draw, the event has an important cause. During Bow Wow in the Park, organizers collect money and donations that go to benefit rescues and other animal support groups. This year, several shelters and animal rescues joined groups like Desmond’s Army and Bikers Against Animal Cruelty. “Our organization raises money for animals that were abused, neglected, or basically left to die,” said Rosalie DeCrosta from BAAC-CT.
DeCrosta said the organization directly gives money to veterinarians to provide treatment or surgeries to animals that are abused and abandoned. They also supply animal control offices across the state who often face budget cuts. “We give as much as we can,” DeCrosta said. BAAC-CT also holds silent protests outside court buildings where animal abusers are on trial. DeCrosta said preventing animal abuse is an important way to prevent other violent crimes, too. DeCrosta said motorcycle drivers are often some of the most compassionate people she’s met, so it’s fitting there is a group of bikers committed to helping animals. “They would risk their own lives for these animals,” DeCrosta said of her team. 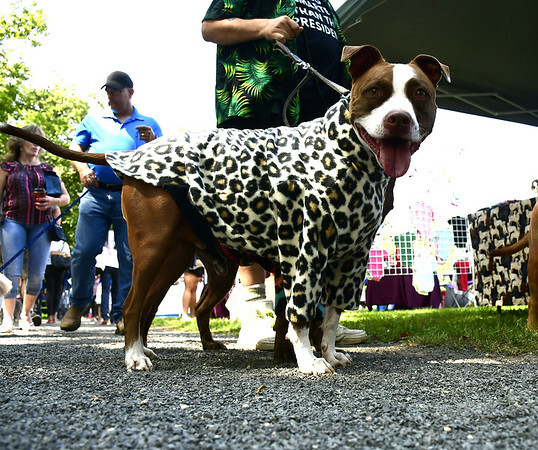 There was also a talent show and a canine costume contest at the event, and this year added a “Pitty Kissing Booth.” One point of the kissing booth, which was named after pit bulls, is to combat the stigma of pit bulls being aggressive and violent. For $1, people could donate and receive a kiss from a dog at the booth. All money from the booth went to a dog named Duke who is going through heartworm treatment. This is also the second year of the “Pitty March” where dogs and their owners marched around the park. This year’s Pitty March benefitted BARC-CT.
Posted in New Britain Herald, General News on Saturday, 1 September 2018 15:59. Updated: Saturday, 1 September 2018 16:02.